Posted on 11, July 2016 by EuropaWire PR Editors | This entry was posted in Education, Science, Switzerland, Technology and tagged 2016 International Physics Olympiad, IPhO, Irchel Campus, physics, University of Zurich. Bookmark the permalink. From 11 to 17 July, over 400 talented young students from 84 different countries will go head to head at the 2016 International Physics Olympiad (IPhO) at the University of Zurich. But the IPhO 2016 is not only an intellectual contest: It is also a great opportunity for the competitors to meet peers from all over the world. During the event, some 950 science enthusiasts will transform Irchel Campus into a global epicenter of physics. Overall, 84 countries from every corner of the globe are represented with a team of up to five students; all participants are under the age of twenty. The competitors represent the top physics students in their country, having won the respective national qualification for the international final in Zurich. The two host countries, Switzerland and Liechtenstein, are sending a team of five and three high school students, respectively. The competition begins in earnest on 12 and 14 July: During a five-hour experimental exam and another five-hour theoretical test, the students will apply their knowledge and skills to solve problems that go far beyond what they have learned at school. They will also need plenty of creativity, resourcefulness, and endurance to tackle tough questions about mechanics, thermodynamics, electromagnetism, optics, the theory of relativity, and quantum mechanics. But the exams aren’t just challenging to the students: It took a team of almost 20 experts simply to design the practical and theoretical parts of the competition. It is critical that the test questions, which are reviewed by 165 country delegates and translated into 50 languages, are demanding yet also manageable. And, naturally, questions from the previous 46 International Physics Olympiads can’t be repeated. 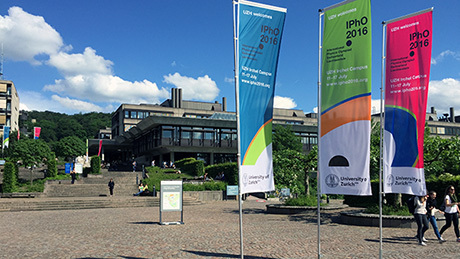 The IPhO 2016 kicks off with an Opening Event at UZH’s Irchel Campus on 11 July at 10:00 am. Some 950 physics enthusiasts will be at the big event; in addition to the competitors themselves, attendees include the chaperones, observers and visitors from abroad, UZH physicists, organizers, team leaders, and over 100 volunteers. The event winds down with a Closing Ceremony on 17 July at the Zurich Tonhalle, where the champions will be awarded their gold, silver, and bronze medals. No doubt many of these bright young minds will go on to study physics or another subject in science and embark on a promising career in the private sector, in research, or in management.